Michael A. Randolph, M.D., P.C. Dr. Michael A. Randolph is a board certified Internist who has established his practice on a foundation of excellence, efficiency, and quality patient care. His specific interests include men's health, hypertension, and diabetes. Over the years, Dr. Randolph has cultivated strong partnerships with patients, often going above and beyond to ensure that patients are living their healthiest lives. After completing his undergraduate education at the University of Pennsylvania, Dr. Randolph continued his medical education at George Washington University School of Medicine and Health Sciences, and finished his residency at the Washington Hospital Center. He also served as an attending physician on active duty for four years at Womack Army Hospital, stationed in Fort Bragg, North Carolina. He is also a veteran of the Desrt Storm/ Desert Shield conflict, where he spent 6 months overseas in Saudi Arabia. 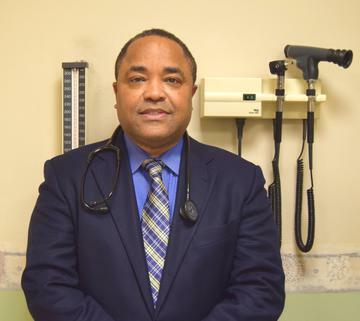 Following his time in the army, he moved with his family to Baltimore in 1995, where he started a private practice as an employed physician under HelixCare, currently known as Medstar Physician Partners. He also served as a regional Medical Director for HelixCare. In 2002, Dr. Randolph established his own private practive in the 33rd Street Professional Building. He continued to focus on "patient centered care" with efficient utilization of Electronic Health Records (EHR), staying up to date with the latest advances in delivering primary care medicine; such as, access to a secure patient portal and telemedicine video conferencing. He has served as Chief of Staff of Medstar Union Memorial Hospital and continues to serve as a member of the Board of Medstar Union Memorial Hospital. In his spare time, Dr. Randolph enjoys listening to smooth jazz and going to Baltimore sports games. He enjoys working out and has affection for the the color purple and Prince.